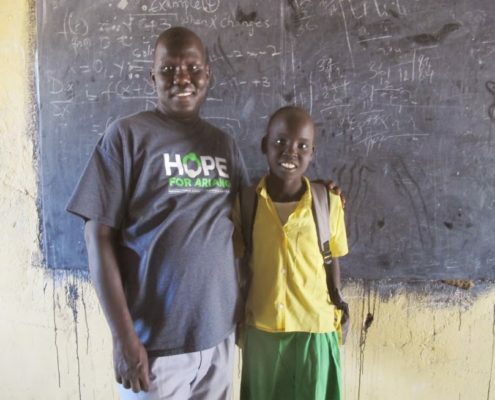 Gabriel Bol Deng, our Founding Executive Director, has overcome unbelievable obstacles in life. He was 10 years old when North Sudanese militiamen led a violent attack on his village of Ariang in South Sudan in 1987. He fled into a forest, not knowing the fate of his parents or siblings. After his escape, Gabriel embarked on a perilous four-month long journey, crossing the Nile River and untold miles of desert; surviving disease and devastating hunger to reach the Dimma Refugee Camp in Ethiopia. HOPE for Ariang Foundation was founded by Gabriel Bol Deng. Due to civil war in Sudan, Gabriel was resettled in the United States through the U.S. Refugee Resettlement Program in 2001 (read his full life-story here).